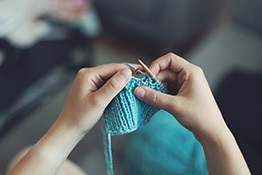 The Eagle Point Friends of the Library will host a beginning knit and crochet class for kids and adults each Wednesday from 2:00 – 3:30 p.m., in the Community Room of the Eagle Point Branch Library, 239 West Main Street. Whether you are a beginner or an experienced knitter, come join the fun as we learn together. All experience levels and ages welcome. Materials and instruction will be provided, or you can bring your own supplies and projects. Supplies and support for this crafting project are generously contributed by the Eagle Point Friends of the Library. For more information, call the Eagle Point Branch Library at 541-826-3313.